It is widely recognised globally that there is a link between diabetes and incontinence. Indications suggest that it is mostly prevalent in those with Type 2 Diabetes and most likely due to weight issues and poor glucose management (1) which may lead to deterioration of nerves and muscle health. Incontinence can have a significant impact on the quality of life for those affected. The freedom of being continent is often taken for granted. Those with incontinence face many challenges related to going out, exercise, concerns about the location of toilets and dealing with accidents. Assisting those affected to prevent, improve or manage their incontinence will have a great impact on their quality of life. 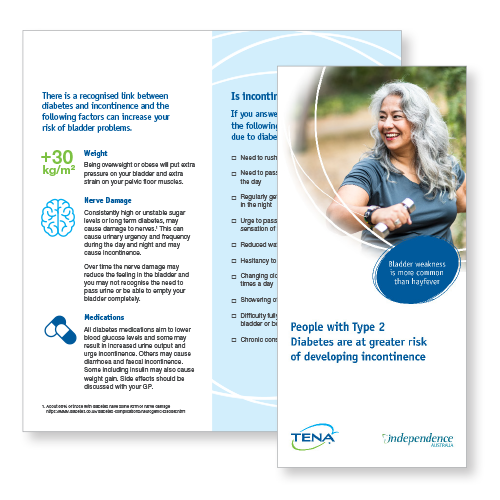 Below, we discuss how diabetes can contribute to incontinence and what you as a Healthcare Professional can look for to identify the risks and how you can assist your clients. 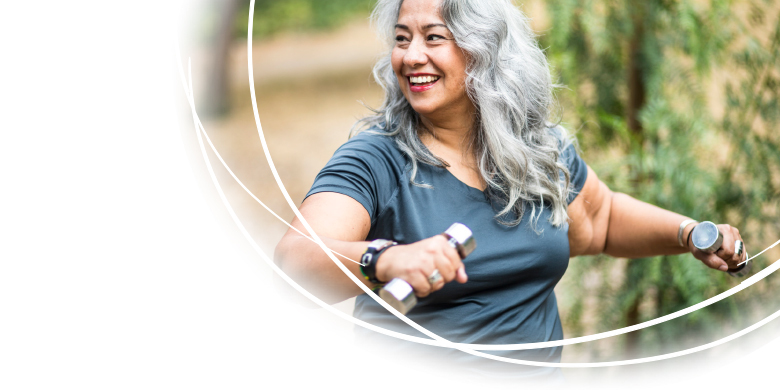 Wearing a continence product whilst exercising can help with dryness and security and can increase your client’s confidence and the desire to keep exercising. This can be a short-term situation while pelvic floor control is regained. TENA has a wide range of sizes and styles to assist those with varying levels of incontinence including a bariatric range, pull up pants and pads and liners for light leakage – the correct pad and a good fit ensures comfort and protection. There are several factors that can either cause incontinence in a person with diabetes or can exacerbate an already existing issue. Below are some of the issues and ways that you, as a Healthcare Professional can inform and guide your clients. Incontinence may be difficult for a client to discuss, so we have listed signs to look for that could indicate incontinence is holding your client back. If a person with diabetes is overweight or obese it will put increased pressure on the bladder which may result in urinary frequency or urge incontinence. Excess weight also puts a strain on pelvic floor muscles, weakening them over time. Going to the toilet more than 8 times a day. Needing to get up overnight frequently to void (nocturia). Rushing to the toilet for fear of having an accident. Smell of urine due to leakage onto clothing, into footwear, onto furniture. Showering more often due to accidents. Clothes or underwear changed several times in a day. Reluctance or rejection of drinking water/fluids due to fear of frequent toilet visits. Reluctance to go out or go on long trips due to the fear of needing to go to the toilet. Proneness for constipation – If clients are constipated there could be faecal mass pushing on the bladder causing irritation and reduction in capacity. Reluctance or avoidance of exercise due to leakage. Discuss how weight loss could have an impact on incontinence as well as their diabetes and other health issues. A healthy diet can promote weight loss. Encourage and discuss various types of exercise to aid with weight loss. Discuss pelvic floor exercises to reduce incontinence (pelvic floor exercises) Refer your client to a trained continence physiotherapist if needed. Educate your clients to try to hold on a bit longer when they feel the need to void to avoid a poor bladder capacity. Refer to a continence advisor for bladder retraining if needed. It is known that poorly managed or long term diabetes may cause damage to nerves, mostly expressed as peripheral neuropathy (usually in the feet). About 60% of people with diabetes have some form of nerve damage. A neurogenic bladder is a form of diabetic neuropathy in which selective damage leads to autonomic neuropathy where the nerves affected result in decreased urination frequency(7). This requires a specialist urological assessment and should be referred to a GP. Frequency and urgency of urination. Reduced sensation of urination, may result in incontinence. Straining to void or open bowels. Incomplete emptying of bladder or bowels. Signs of chronic constipation or faecal impaction. Urine is concentrated as bladder not emptied regularly or properly. Urine may be pungent if a Urinary Tract Infection (UTI) is present due to incomplete bladder emptying. Educate your client in ways to achieve stable Blood Glucose Levels (BGL) to reduce risk of nerve damage – refer to a GP if nerve damage is already evident. Advise your client to allow time for proper emptying of the bladder to avoid residual urine – best practice is to sit fully (even Men), relax and lean forward with elbows on knees, and feet supported on the floor or a small stool (8). If there are difficulties in emptying the bladder and this technique is not helping, refer to a GP. Monitor for signs of urinary retention or UTI (more commonly seen in those with low immunity and older people). There may be few, vague or no direct indications of an ongoing UTI. If client is experiencing chronic constipation or faecal impaction discuss ways to add fibre into their diet and the need for good hydration. Discuss wearing an incontinence pad to assist with social continence and quality of life. All diabetes medications aim to lower blood glucose levels and some may result in increased urine output and urge incontinence. Others may cause diarrhoea and may cause faecal incontinence. Some including insulin may also cause weight gain. Increase in need to void. Weight gain that is not diet related. Discuss possible side effects related to certain medications with GPs and educate clients. Advise client if side effects do not resolve or worsen to discuss with GP. Dietary modifications may help manage diarrhoea if the diabetes medication is unchangeable. Adding insoluble fibre can firm up stools. Try foods including - oats, barley, rye, fruit or vegetables. Advise client - there are also medications to treat the diarrhoea. Diarrhoea related to antibiotics usually resolves once treatment has ceased. If symptom is severe client may need to consult GP. To help manage incontinence TENA has a wide variety of pads to suit the individual to maintain comfort, hygiene and quality of life. The incidence of infections is increased in those with diabetes mellitus (9) High blood sugar levels can weaken the immune system as a hyperglycaemic environment can enhance the virulence of certain microorganisms (9) which may increase the risk of developing a UTI. This may exacerbate pre-existing incontinence or may cause urge incontinence. Bladder irritability or urge incontinence. Signs of infection - fever, chills, feeling hot, sweating, changes to skin integrity, cough. Signs of confusion, impaired cognition, or malaise in the elderly could indicate a UTI. Signs of a UTI - pungent urine, increased frequency of urination, dysuria, haematuria. Educate client in ways to maintain stable blood sugar management to lessen their risk of infection and incontinence. Monitor for signs of infection and educate the client how to recognise them. Educate about good perineal hygiene to avoid skin breakdowns and the risk of an ascending infection into the bladder/kidneys. Urine leakage that is left unattended can increase bacteria on the skin which could increase the risk of a UTI. People with diabetes are also more prone to yeast infections. (9) Good perineal care may help avoid vaginal thrush – recommend avoiding spermicides and douches. Eating foods with active cultures such as yoghurts, fermented foods, kimchi could be recommended. 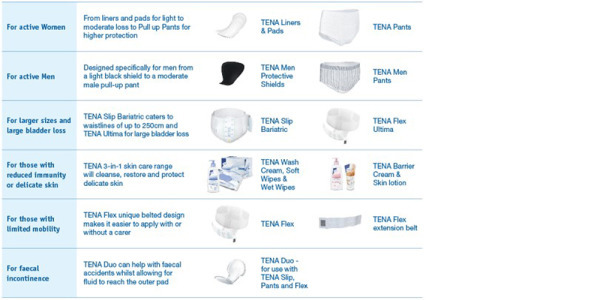 Consider recommending TENA incontinence products to assist with dealing with leakage whilst management regimes are being put in place. If a person can exercise or go out socially because of a TENA product - we have had a positive impact on their quality of life.